First & Oak Restaurant: Wed-Sunday 5:30 - 9:00 p.m. 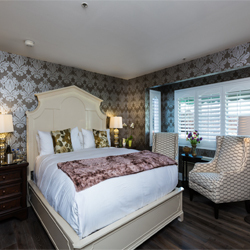 The Mirabelle Inn is a newly remodeled, charming 12-room boutique hotel offering first class service. We are located in the heart of Solvang, steps away from the theatre, shopping, wine tasting rooms, and restaurants. We offer a complimentary breakfast, a bottle of wine from Coquelicot Estate, complimentary WiFi, and premium satellite TV. Dine with us at First & Oak restaurant. Our star Chef Steven Snook creates California eclectic fare, emphasizing seasonal and organic.